every Ironman is followed by the post-Ironman blues. the sudden sensation of listlessness, loss, confusion, emptiness. all related to the sudden release of energy on race day, combined with abrupt absence of training in the schedule, added to the removal of a focal point that's consumed so much of your life. it creates a vacuum, a lack of direction, even a loss of meaning. we've all dealt with it. any of us who've done Ironman. those of you who've done one know what i'm talking about. it's funny. you think that having accomplished something so significant would leave you with a sense of fulfillment that would last long after, and thereby grant a measure of peace welcoming time to rest on your laurels. but it never seems to work out that way. instead it's questions like: what do i do? where do i go? who am i now? what did it mean? and of course: holy smokes, what's with all this free time?!?! it verges on existential. even metaphysical. i tend to take it for what it is: the follow-through of an emotional roller-coaster that marks the recovery phase from a major transformative event...which--and let's be honest--every Ironman is, no matter how many you have done. you just don't go that far on the edge without it leaving an effect on you. for me, it tends to make me a bit pensive, introspective, even reclusive. it's at times like these i usually find myself turning to a recurring slate of things that comfort me. food, music, movies...especially movies...and oddly enough, ones with Audrey Hepburn. 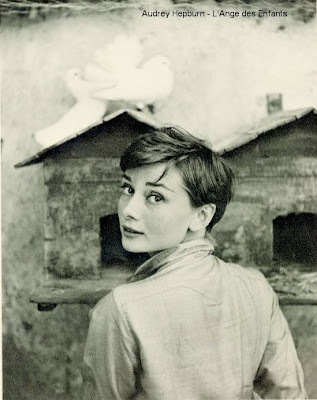 i don't know what it is about Audrey Hepburn that does the trick. maybe it was her eyes. maybe it was her smile. maybe it was her voice. maybe it was just her. all i know is, there are some films with her that seem to fill a void in my life...a void very much akin to the void i feel in the wake of an Ironman. it's weird, i know. i can't explain. something about her--or the characters she played--just seems to make me feel better. invariably, whenever i come across a time when i start to feel a little blue, i find myself watching her movies again and again and again. a time kind of like now. funny face: how long has this been going on? my fair lady: wouldn't it be loverly?